The Bible is our only objective, absolute, written connection between the invisible world and this visible, physical world of time and space. Without the Bible, mankind has no answers to the basic life questions man must answer, nor can he have any certainty that anything is real or meaningful including his own body and his own thoughts. Thanks to God’s love and desire to communicate absolute truth to mankind, we have a Book in human language wherein every word and sentence is inspired by God through the men whom God selected to do the writing as His co-authors. God not only inspired every word and every book in the Bible, He also worked so that the inspired authors wrote an accurate picture of theology, history, the physical world, and the invisible world, and this to such an extent we can claim the Bible is “inerrant.” The Bible, thus coauthored, is the “written Word of God,” written 100 percent by God and at the same time, 100 percent by man. As Christ is the “living Word of God,” 100 percent God and at the same time 100 percent man, so the Bible is 100 percent by God, while also 100 percent by man under the inspiration of the Holy Spirit. This is what the mainstream, historic Church has believed for the past two millennia. Skepticism about the Bible’s inerrancy and total inspiration by God has only come onto the scene of history as a major controversy since the late 1700s and early 1800s, and only has been a concern for the Body of Christ in America since the early 1900s. By 1977, many evangelical seminaries, colleges, churches, denominations, mission agencies, and publishing houses were absorbing a less-than-Biblical, neo-orthodox view of the Bible from liberals who were ensconced within evangelical circles. Thus they were departing step by step from the basic, historic doctrines of Christianity while all along thinking it was alright to do so. Because we live in a fallen world of fallen men wherein the devil, though defeated and dethroned, is still running around with great freedom, every excellent church or organization God raises up at any point in history will have a tendency to deteriorate and “float downstream with the current,” unless a constant watch is maintained by “watchmen on the wall” to guard from this tendency. Thus by 1977, a major “reformation” was needed in the area of reinstating the Bible to its proper place with the honor due to it as the fully inspired, authoritative, inerrant Book from God, which it is. Once we had the basic plan set and the team of some 53 world-respected theologians and Christian leaders united in this purpose, we assigned 14 white papers to be written by this team. Within these 14 white papers each of the 17 major issues about the Bible were addressed so the falsehoods being taught could be exposed and so the true history and true Biblical principles could be clarified. Some of the chapter headings dealing with the key issues involved were: “Christ’s View of Scripture” and “The Apostles’ View of Scripture,” “Higher Criticism,” “The Inerrancy of the Autographa,” “The Adequacy of Human Language,” and “The View of Scripture Held by the Church.” We sent that set of papers (the mailing packets weighed about two pounds each) to each of the 270 Christian leaders who were personally invited to the Summit Meeting in October of 1978, and asked them to try to look them all over before arriving at the Summit. This set of 14 scholarly white papers was edited by Dr. Norm Geisler and has been available since shortly after that Summit Meeting with the title Inerrancy, published by Zondervan in 1980 (see also footnote 9, p. 18 for e-book including Sproul’s commentary). As far as we know the liberals within and without evangelicalism have never attempted to answer these 515 pages which totally refute the liberal’s partial and unsatisfactory view of the Bible. For those who can handle the heavy theology, this book, Inerrancy is a “theological atom bomb” that demolishes all liberal foolishness which attempts to undermine the Bible. We affirm that the Holy Scriptures are to be received as the authoritative Word of God. We deny that the Scriptures receive their authority from the Church, tradition, or any other human source. We affirm that the written Word in its entirety is revelation given by God. We deny that the Bible is merely a witness to revelation, or only becomes revelation in encounter, or depends on the responses of men for its validity. We deny that human language is so limited by our creatureliness that it is rendered inadequate as a vehicle for divine revelation. We further deny that the corruption of human culture and language through sin has thwarted God’s work of inspiration. We affirm that God’s revelation in the Holy Scriptures was progressive. We deny that later revelation, which may fulfill earlier revelation, ever corrects or contradicts it. We further deny that any normative revelation has been given since the completion of the New Testament writings. We affirm that the whole of Scripture and all its parts, down to the very words of the original, were given by divine inspiration. We deny that the inspiration of Scripture can rightly be affirmed of the whole without the parts, or of some parts but not the whole. ARTICLE VII We affirm that inspiration was the work in which God by His Spirit, through human writers, gave us His Word. The origin of Scripture is divine. The mode of divine inspiration remains largely a mystery to us. We deny that the finitude or fallenness of these writers, by necessity or otherwise, introduced distortion or falsehood into God’s Word. We deny that any essential element of the Christian faith is affected by the absence of the autographs. We further deny that this absence renders the assertion of Biblical inerrancy invalid or irrelevant. We deny that Biblical infallibility and inerrancy are limited to spiritual, religious, or redemptive themes, exclusive of assertions in the fields of history and science. We further deny that scientific hypotheses about earth history may properly be used to overturn the teaching of Scripture on creation and the flood. We deny that it is proper to evaluate Scripture according to standards of truth and error that are alien to its usage or purpose. We further deny that inerrancy is negated by Biblical phenomena such as a lack of modern technical precision, irregularities of grammar or spelling, observational descriptions of nature, the reporting of falsehoods, the use of hyperbole and round numbers, the topical arrangement of material, variant selections of material in parallel accounts, or the use of free citations. We affirm the unity and internal consistency of Scripture. We deny that alleged errors and discrepancies that have not yet been resolved vitiate the truth claims of the Bible. We deny that Jesus’ teaching about Scripture may be dismissed by appeals to accommodation or to any natural limitation of His humanity. We affirm that the doctrine of inerrancy has been integral to the Church’s faith throughout its history. We deny the legitimacy of any treatment of the text or quest for sources lying behind it that leads to relativizing, dehistoricizing, or discounting its teaching, or rejecting its claims to authorship. We affirm that a confession of the full authority, infallibility, and inerrancy of Scripture is vital to a sound understanding of the whole of the Christian faith. We further affirm that such confession should lead to increasing conformity to the image of Christ. We deny that such confession is necessary for salvation. We further deny, however, that inerrancy can be rejected without grave consequences, both to the individual and to the Church. 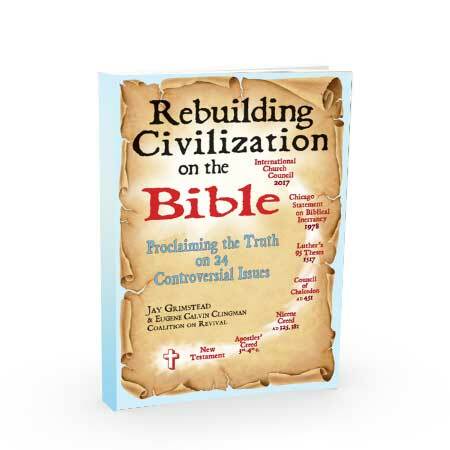 This article is an excerpt from Dr. Jay Grimstead’s Nordskog Publishing book Rebuilding Civilization on the Bible: Proclaiming the Truth on 24 Controversial Issues. Starting in the 1970s, God inspired Dr. Jay Grimstead to create several crucial theological movements. At one time, the ACLU called Dr. Jay, as his friends refer to him, the most dangerous man in America, because he brought evangelical Christians of every theological heritage to the same table, towards agreeing on the essential tenets of the Biblical Christian faith. Two websites represent Dr. Jay’s current efforts—the Coalition on Revival and the International Church Council Project—both dedicated essentially to the restoring of the Bible’s central place in the lives of men, its inerrancy, and its authority over the lives of mankind in every sphere of life.